The popcorn machine has been a complete success. I don’t know how I lived without this thing before. Easy to assemble (place cover on machine and plug in) and I don’t burn myself with hot oil like I did with the stove top method. Bliss. I am, however, still using stove top method for my espresso. Which is causing me some problems. 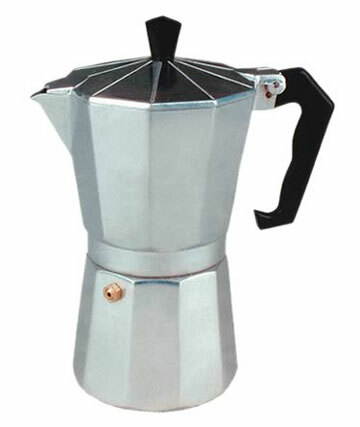 I got the above pictured stove top espresso machine for my birthday about a month ago and I’ve used it quite a few times and still, STILL, I am not making espresso. I am making strong coffee. And don’t get me wrong – strong coffee is awesome. But I want espresso. With the caramelly stuff on top. I haven’t got the water:espresso ratio down yet either. Boo. What I really would like (hello wedding registry!) is an actual espresso machine. With a metal foamer and everything. But that will take time so for now, does anyone out there know how the hell to make espresso in my espresso maker? 1) I used white wine instead of vegetable stock (win) but forgot to supplement the wine with a little bay leaf and other such vegetable stock spices. 2) I effed up the pastry, forgetting that I needed double the chickpeas for this one, and so the top was too small for the pie. 3) I accidentally added vanilla almond milk to the vegetable mixture. I’m thinking 1 and 3 had the most impact. Sigh. It wasn’t terrible in the end, but it wasn’t great either. Thank goodness for the side of beets and turnip with marjoram. New recipe tonight I think…I’m thinking stir fry. Update: just took a sip from my recently brewed pot…Yowza but that’s strong coffee. Not espresso. My pumpkin mug is disappointed. ← >not mmm mmm good. >I don't know how to make espresso, but my coffee has that foamy caramelly stuff on the top that you are talking about. I know that is no help, but I make it in a french press, super strong! >I definitely miss our cooking adventures. Cooking alone just isn't the same. Oh and I laughed out loud at the vanilla almond milk comment.